A quick overview of the different sections of Current RMS. Along the menu bar at the top of each screen are links to the main areas of your Current RMS system. In this guide, we’ll give you a quick breakdown of what each of the sections are for and why you’ll use them. This is the first page you’ll see when you log in to your Current RMS system; it’s a window into how your rental business is doing. The dashboard gives you a breakdown of your financial performance this month, along with tiles that link to the core areas of the system that need your attention. 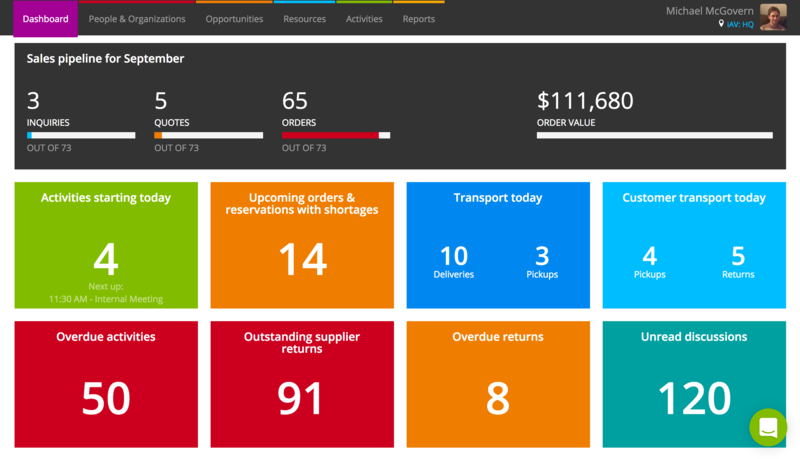 See a count of your opportunities and your monthly order value. Get a list of all deliveries and collections for the day. View all of your activities starting today, plus those that are overdue. Check out any unread discussions. 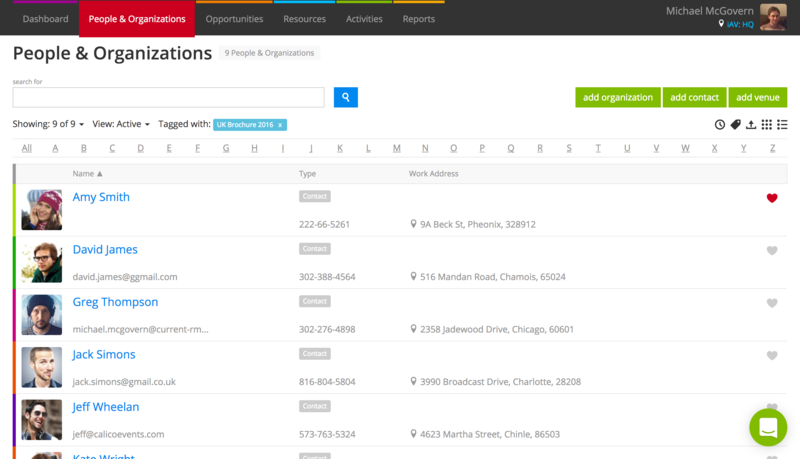 Much more than just a database of your contacts, this is a CRM designed for rental businesses. The People & Organizations section not only allows you to store your customer details, but it populates with previous order history, activities, discussions, and other information from throughout the system so you can get a full picture of your customer and colleague interactions. Store your customer and contact details, including multiple telephone numbers, addresses, websites, and social media links. See a complete history of your opportunities with a client. Set up a database of venues. Make contacts, users, and venues bookable resources for services you provide. Keep your organizations in sync with an online accounting solution. Opportunities is where you’ll manage the whole rental cycle in Current RMS. This section handles everything from general information gathering right up to invoicing, letting you send out compelling quotations and get your kit out of the warehouse reliably at order stage. Manage your order items, raise invoices, communicate with your customer, and print any paperwork all from one screen. Record general inquiries and develop them to orders. Create quotations and send them out online for client approval. Group similar quotations together in a Project. Manage the order process, including allocating assets, preparing kit, and booking in & out your items. Add services that you provide to your orders and allocate contacts, users, vehicles and venues to perform these. Print picking lists, delivery notes, and other documents. Generate invoices based on opportunities or projects. Post invoices over to an online accounting solution and see payments in real time. 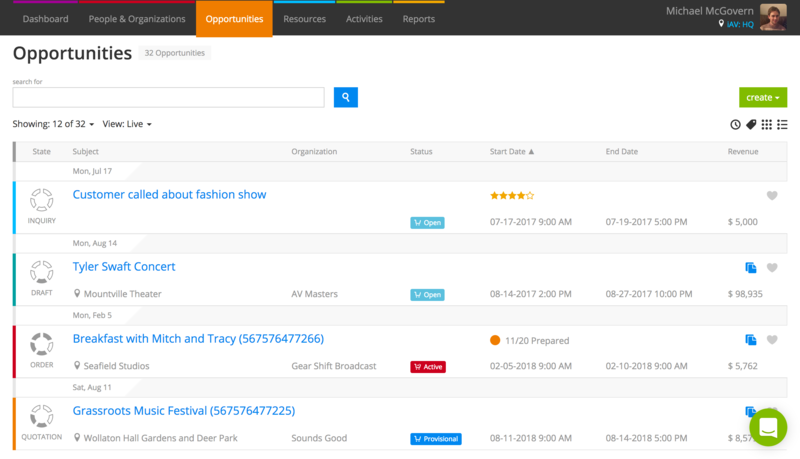 Get an overview of all opportunities using the Job Planner. View all of your products and services, see their status, and check out their history from the Resources section. Use the powerful Availability screens and Resource Planner to get a global overview of your stock and services at-a-glance, or even drill down into individual products or services to properly forecast for the future. Create an inventory of your products and keep track of your stock levels. Add a list of services that you provide to your customers. See what products are available and a calendar of all of your services now and in future so you can plan accordingly . Get a complete history of a product or asset -- see when it was last out and who’s had it. Generate barcode labels for your assets. Keep on top of products that are lost, damaged, or in for service with the Quarantine. Use accessories to add products to other products so that linked items always go out together. Manage stock in multiple locations using Stores. Say how much you charge for a product or for a service when you add it to an opportunity. Activities are at the heart of Current RMS; schedule activities against organizations, products, opportunities, invoices, quarantined items, and lots of other places in the system to keep track of what you need to get done. You can copy in your other Current RMS users (and even contacts & organizations! 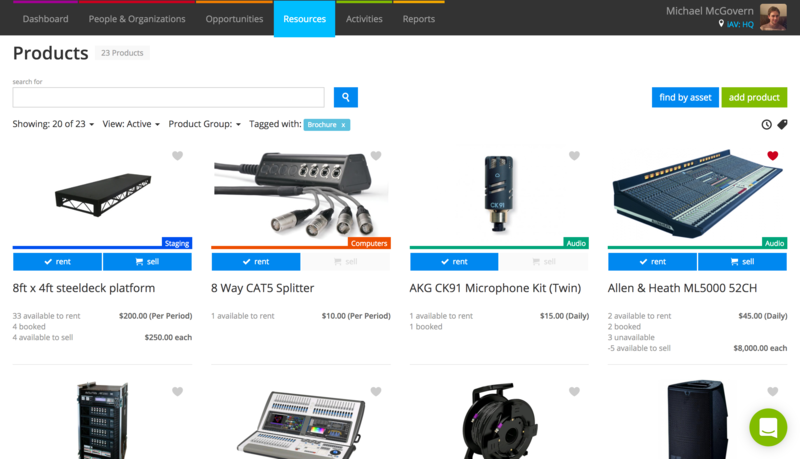 ), and use the Activities section to get an overview of what everyone is up to. Schedule reminders and to-dos throughout the system. See a complete list of your pending or completed activities. 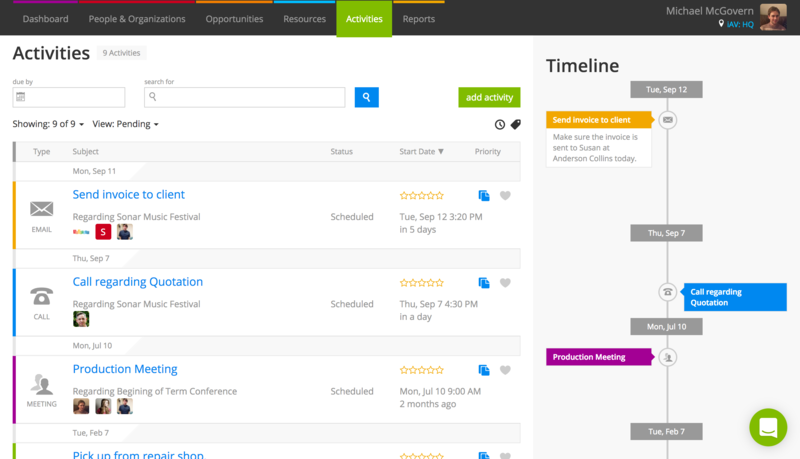 Get an overview of what everyone in your business has going on in a calendar view. Record periods of unavailability for contacts, users, vehicles, and venues that are bookable for services. Pull your activities calendar and any service bookings out of Current RMS using an iCal feed. Stay on top of your customer and colleague interactions. 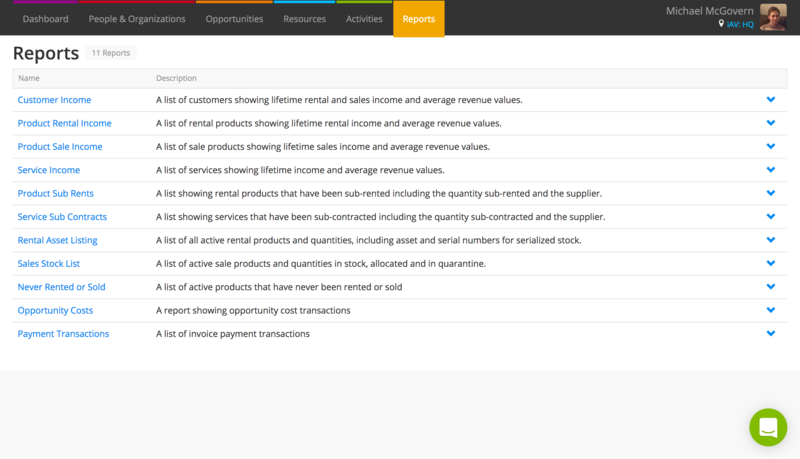 The Reports section lets you see information about your assets, customers, and revenue for the lifetime of your system. Make informed decisions about which kit to invest in and see your customer loyalty. Only administrators can see Reports. If you are a non-administrator, you’ll see Favourites here. Administrators can find Favourites by clicking on their user icon at the top-right and choosing ‘Favourites’ from the menu. See which products and services are the most popular and are making you the most money. Get an overview of your customers’ spending. Download information from Current RMS and work with it in Excel, Numbers, or another spreadsheet application. It’s not along the menu bar at the top, but System Setup is where you can completely customize your Current RMS system so it works for you. 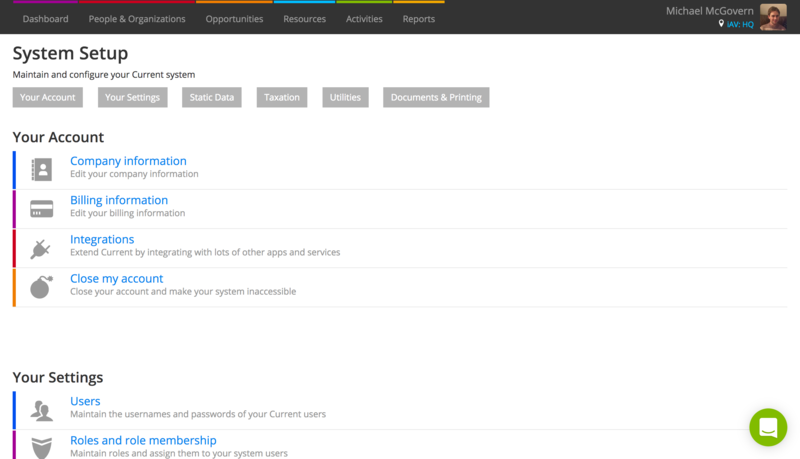 Find System Setup under the “My Account” heading at the bottom of every page, or by clicking your user icon at the top-right and choosing System Setup from the menu. Add and change your company and store information. Manage your account, billing details, and users. Configure third-party integrations like Xero. Set up your rental charging. Customise general system preferences, such as invoice numbering. Change how Current charges tax. Import and export your data. Modify quotations, invoices, and other document layouts generated by the system.